Mechanical doorbells have been around for ages and believe it or not, but in this age of electronic devices, this type of non-electrical doorbell can still be purchased today. You will not find a mechanical doorbell in any new or newer subdivision but If you walk up and down the street in any old neighbourhood you will see plenty of them. The principal of a mechanical doorbell is pretty straightforward. A turn handle is mounted on the exterior side of the door and the bell on the interior side. Mechanical doorbells either announces a visitor with the sound of a buzzer or bell. The majority of mechanical doorbells do use a bell. Some models however produce a buzzer sound by a vibrating component which is less audible than the the bell type. By turning the handle (1) an arm with two small disks (2) is spun around forcing the two disks to the outside where they hit a small pin on the inside of the bell cover (3). The sound is similar to a "Ring for Service" desk bell that you may find in places where the desk person is working in another part of the building. Doorbells come in many shapes, sizes and methods of operation, with the most common type of doorbell today being a simple push button. Doorbells were invented as another means of alerting a homeowner know a visitor was at the door outside (prior to this door knockers were the method of choice). Doorbells have ranged from a bell with a rope attached to it outside the door to modern wireless doorbells.Mechanical doorbells became popular in the Victorian era because of their simplicity of design and remain popular today for the same reason and because they a unique addition to any front door. A mechanical doorbell is simple design that is installed directly into the door (not adjacent to the door like most modern bells). A simple "turn" knob on the exterior rings a bell that is located on the interior side of the door. These bells were usually ornate in design and varied styles were available. 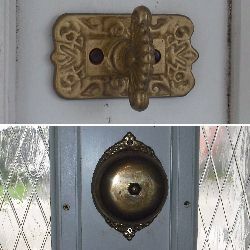 Solid brass mechanical doorbells are a wonderful way to add extra detail to your front door and a simple solution if a doorbell is not currently installed in your home. Since mechanical doorbells do not require electricity it is a great way to avoid added costs of hiring an electrician to wire a new doorbell. The installation of a mechanical doorbell is also a wonderful way to create a new theme for your front door hardware. Replacing older doorknob sets with solid brass or installing a new door kick plate are both great choices to enhance a common theme. Although it is not necessary to use the same pattern for all these items, the use of a common finish (such as polished brass, oil rubbed bronze or antique brass) will help tie the look together for you. Mechanical (or "Twist") doorbells are an unusual and unique addition to any front door. The "twist" knob is a great touch of detail and a charming way for guests to announce themselves. Search for solid brass construction to ensure high quality and durability. Doorbells are a focal point of any entryway set but they are often overlooked when replacing older and worn hardware. Try something different by replacing or adding a new mechanical doorbell to your Victorian or modern home. This is a sure way to transform a plain front door into a showpiece.